This article is about the soft confectionery. For the mushroom known as Jelly Babies, see Leotia and Leotia lubrica. Jelly Babies are a type of soft sugar jelly sweet, shaped as plump babies in a variety of colours. They were first manufactured in Lancashire, England in the 19th century. Their popularity waned in England before being revived by Bassett's of Sheffield, Yorkshire who were responsible for mass producing Jelly Babies from 1918. 'Jelly Babies' are known at least since advertisements by Riches Confectionery Company of 22 Duke St, London Bridge in 1885, along with a variety of other baby-sweets including 'Tiny Totties' and 'Sloper's Babies'. But the pricing of these at a farthing each suggests that they were very much larger than the modern Jelly Baby. The sweets were invented in 1864 by an Austrian immigrant working at Fryers of Lancashire and were originally marketed as "Unclaimed Babies". By 1918, they were produced by Bassett's in Sheffield as "Peace Babies" to mark the end of World War I. Bassett's themselves have supported the "Peace Babies" part. Production was suspended during World War II, due to wartime shortages. In 1953, the product was relaunched as "Jelly Babies". The most noted modern manufacturer of Jelly Babies, Bassett's, now allocate individual name, shape, colour and flavour to different 'babies': Brilliant (red; strawberry), Bubbles (yellow; lemon), Baby Bonny (pink; raspberry), Boofuls (green; lime), Bigheart (purple; blackcurrant) and Bumper (orange). 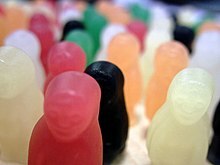 The introduction of different shapes and names was an innovation, circa 1989, prior to which all colours of jelly baby were a uniform shape. In 2007, Bassett's jelly babies changed to include only natural colours and ingredients. There are many brands of jelly babies, as well as supermarket own brands. A line of sweets called Jellyatrics were launched by Barnack Confectionery Ltd to commemorate the Jelly Baby's 80th birthday. Like most other gummy sweets, they contain gelatin. Jelly babies manufactured in the United Kingdom tend to be dusted in starch which is left over from the manufacturing process where it is used to aid release from the mould. Jelly babies of Australian manufacture generally lack this coating. A popular science class experiment is to put them in a strong oxidising agent and see the resulting spectacular reaction. The experiment is commonly referred to as "screaming jelly babies". In 1962, Jelly Babies were referred to as "those kids' candies" in a Supercar episode, "Operation Superstork". When Beatlemania broke out in 1963, fans of The Beatles in the United Kingdom pelted the band with jelly babies (or, in the United States, the much harder jelly beans) after it was reported that George Harrison liked eating them. In the British television programme Doctor Who, jelly babies were often mentioned in the classic series as a confection The Doctor, an alien time traveller, favoured. First seen being consumed by the Second Doctor, they became most associated with Tom Baker's Fourth Doctor, who had a predilection for offering them to strangers in order to defuse tense situations (and in one episode bluffing another alien into thinking them a weapon). The Fifth, Sixth, Seventh, Eighth, Eleventh, and Twelfth Doctors, as well as the Doctor's nemesis the Master, also offered them up in different episodes. In the series, they were often identified simply by the fact the Doctor (and later the Master) usually carried them around in a simple white paper bag. In Terry Pratchett's Discworld series, the country of Djelibeybi (a pun on 'jelly baby', but putatively meaning 'Child of the [River] Djel', and possibly derived from Djellaba) is the Discworld's analogue of Ancient Egypt. The main setting of Pyramids, the country is about two miles wide along the length of the Djel. In May 2013, Australian singer Alison Hams released "Jelly Baby Song" – its content alluding to the consumption of jelly babies by type 1 diabetics to overcome hypoglycaemic episodes as a way to raise awareness for type 1 diabetes for JDRF Australia (Juvenile Diabetes Research Foundation) who sell specially packaged jelly babies as the focus of their annual "Jelly Baby Month" campaign. In 2009, a poll of 4,000 British adults voted jelly babies their sixth favourite sweet. In the film of 2018, Johnny English Strikes Again, the titular character (played by Rowan Atkinson) carries a box of jelly babies with him, but they are actually disguised explosives, as in said context, "jelly" is short for gelignite, and they blow up whoever eats them. ^ a b c d e "Sweet success: Unravelling the Jelly Baby's dark past". BBC. 28 December 2014. ^ “Jelly Babies”. Foods of England. ^ "Bassett's". 22 July 2008. ^ "Confectionery giants cut use of artificial additives". ^ Martin, Nicole (18 March 1999). "Jellyatrics revive those sweet memories". Irish Independent. ^ Creations, DigiPro Multimedia. "Jelly Baby Song - the official Jelly Baby Song website..." www.jellybabysong.com. ^ "Sweet disco for Jelly Baby month". Retrieved 2017-01-11. ^ Chris Irvine (27 August 2009). "Fizzy cola bottle named Britain's favourite sweet of all time". The Telegraph. London. Retrieved 1 April 2012. This page was last edited on 3 April 2019, at 08:39 (UTC).